After a week filled with family, celebrations, and delicious dish after delicious dish, Aaron and I landed back in LA late last night. Can we all just agree that there is no sleep like that which occurs in your own bed? It felt really good to wake up this morning tucked into my own sheets with my head on my favorite pillow. Since New Year’s Eve is tomorrow, I thought we should squeeze in one last champagne cocktail recipe before we bid this year adieu! 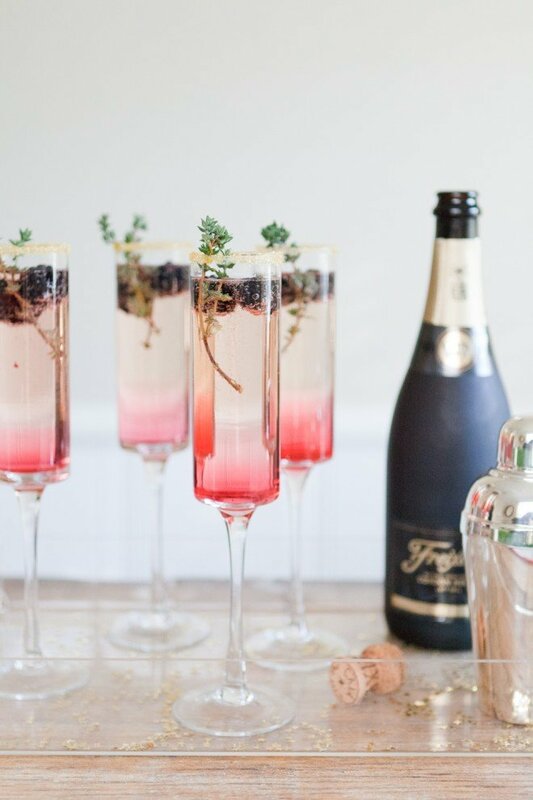 This ombre-colored bubbly cocktail (and the super chic champagne flute) is just as delicious as it is easy on the eyes. Keep reading for the recipe below… and before to drop us a note in the comments. 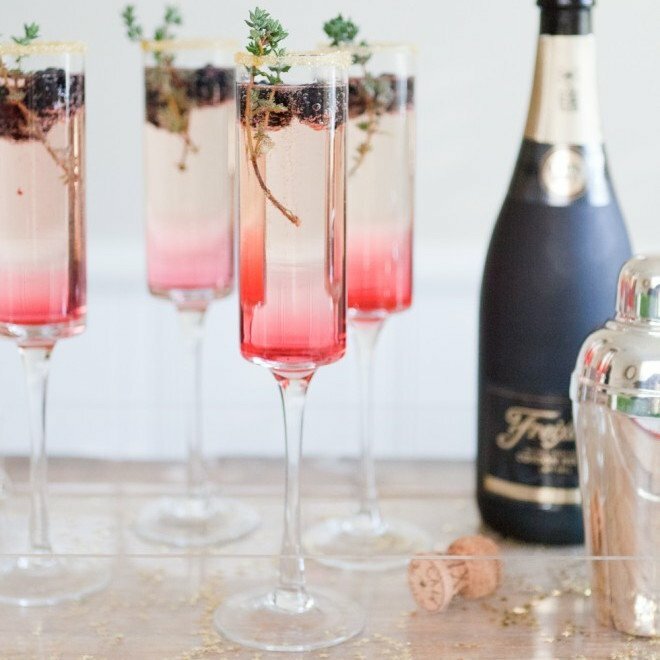 We would love to know what is your favorite champagne cocktail recipe! We first used this acrylic tray for our fall sangria post and it has continued to come in handy ever since. 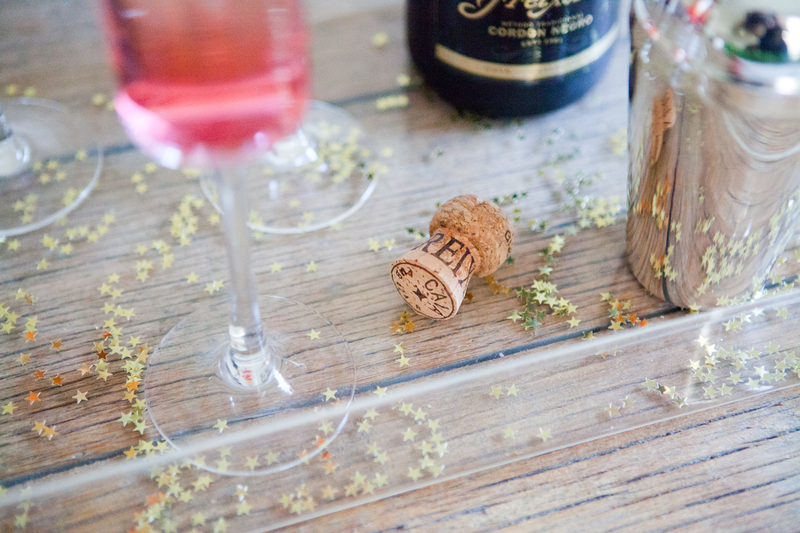 A little bit of gold star confetti and voila: a total NYE appropriate serving tray. I had these luxe leather coasters sitting out during our team holiday party and so many people commented on how great they were. They’re classic and chic and add another layer of texture to a table. Okay, so here is a dirty little secret of getting those beautiful salts and sugars to stay atop the rim: butter. It adheres perfectly. Place the tiniest amount between your fingers and rub just around the rim of the glass before dipping the glass into the gold baking sugar. 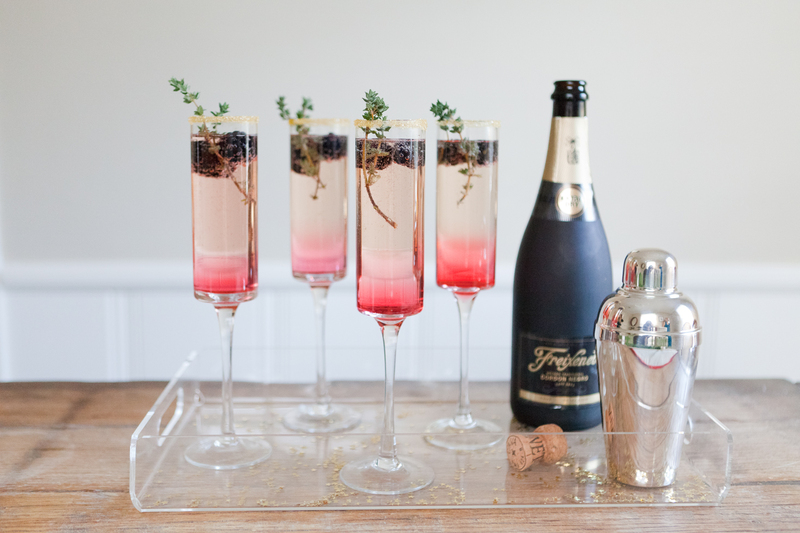 Fill the rest of the glass with champagne and top with a sprig of thyme in each glass. Voila! Great cocktail recipe and look at that baby bump…Beautiful Jen! Thank you so much, Chel! If only I could try it with you! Hope you guys have a great NYE! Let’s set a lunch date soon! Looks delicious! 🙂 Happy new year! Thanks, Andrea! Happy new year to you! This cocktail looks stunning! Rustic and elegant at the same time. Have a wonderful 2014! 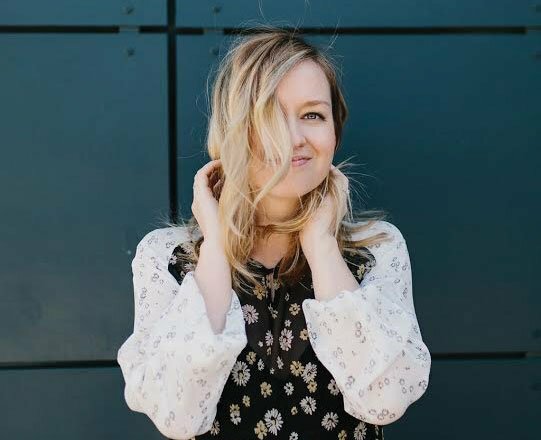 Thank you, Sini! Happy new year! These are absolutely gorgeous my friend! Cheers to 2014! Love these champagne glasses! Where did you get them from? Blackberry & thyme are two of my favorite flavor combinations; blackberries, thyme, goat cheese, and arugula is my go-to flatbread recipe! 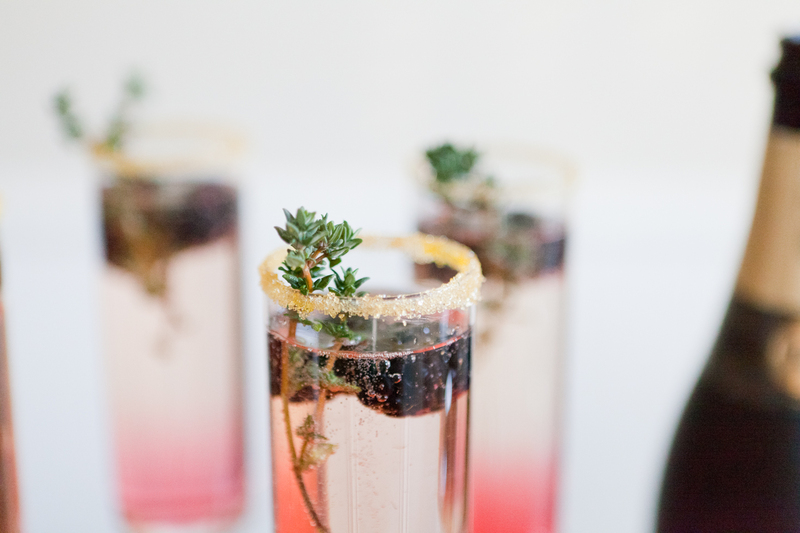 But blackberries, thyme, and champagne!? YES. love the rim with the sugar it almost looks like gold sparkly glitter! Hi! The recipe looks delicious and those glasses really make it stand out. Can you tell me where to find them, what you call them, anything you happen to have on these particular glasses. My sister-in-law and have been looking for them forever with no luck! Thanks and may God bless!! Pingback » 5 COOL DRINKS TO TASTE THIS SPRING! Do you REALLY drink alcohol when you are pregnant ??????????????????? Pingback Friday Links [20.02.15] | Mother. Wife. Dog Lover. gourmet. what the heck is a pregnant lady doing drinking a champagne+gin cocktail? hopefully hers is a non alcoholic version. wow guys, that was a real boo-boo. Pingback Fave Signature Cocktails + New Bar Menus = Party!! Pingback 15 Bubbly Champagne Cocktail Ideas For Your Wedding! Pingback Ombré is the new black - Youpi ! La vie est jolie ! Delicious cocktail! But when we pour everything into the glass that “ombré” effect didn’t happen. Just bright pink top to bottom. Is there an exact order to pour the ingredients? Do we have to wait until the syrup settles? Should we just use one ounce of syrup instead of two? Hey Maude, I am so bummed they didn’t turned out! The ombre effect was such a happy accident and I did my best to replicate it in the instructions exactly as we did it. It’s been almost three years since we made that recipe now, so all I remember is what is there in the text. Did you follow the exact order of the text? Loved this Cocktail! Made it as a welcome drink for my wine tastkng. I followed the instructions but the ombre effect was not as drastic as the picture. However, i did notice the longer they sat, the More the omBre effect was noticeable. The drink tasted great! UsinG the butter to rim the glasses definitely worked just like she said. Such a great tip to Remember for addiding sugar to a glass rim. How did you get the hombre effect in the cocktail, or is the pink on the bottom part of the design of the champagne flute? Hi Vincent, I have to say it was a happy accident. I had no idea it would do this when we were creating them.